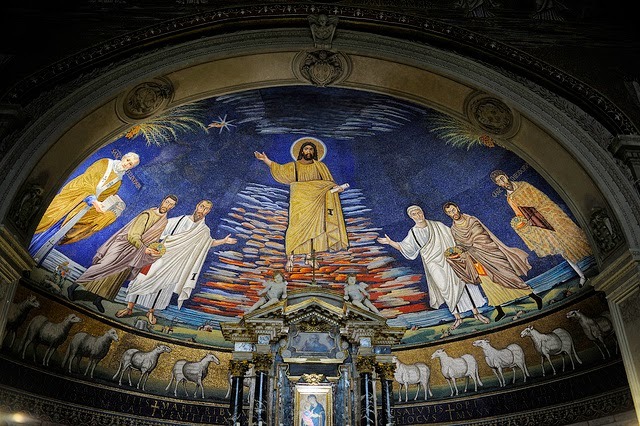 The apsidal mosaic of the Church of Ss Cosmas and Damian in Rome. 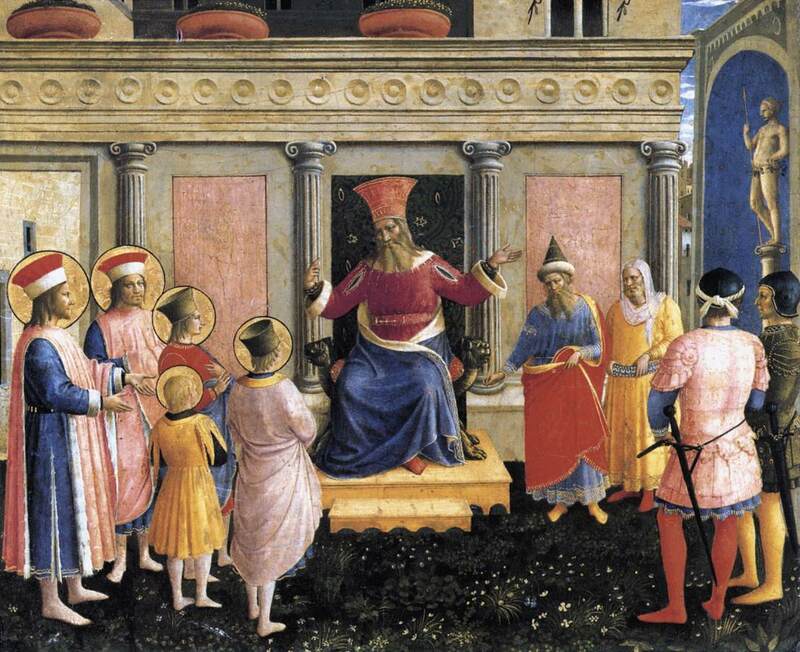 On the far left, Pope Felix IV offers the church which he has built to Christ and His Saints. One of the two brothers is presented to Christ on the left by Saint Paul, the other by St Peter on the right. Peter and Paul, as the patron Saints of Rome, are closer to Christ, and dressed as Roman senators; Cosmas and Damian are wearing clothes that evidently would have look foreign to the eyes of a sixth-century Roman, and their faces are darker. 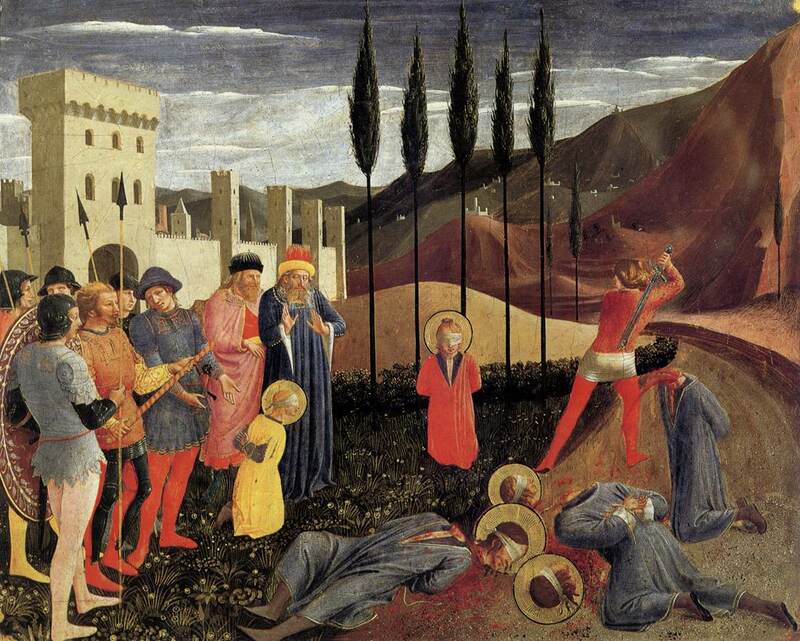 On the far right, St Theodore, whose church is not far away on the other side of the Forum, balances the composition; as a Greek, he is also dressed as a foreigner. Above St Paul’s head, a phoenix, the symbol of the resurrection of the body, perches on a leaf of a palm tree. They are among the Saints named in the Canon of the Roman Mass and the traditional form of the Litany of the Saints; along with four other Unmercenaries, (Cyrus and John, Panteleimon and Hermolaus), they are also named in the Preparation Rite of the Byzantine Divine Liturgy. The Emperor Justinian I (527-565) attributed to their intercession his recovery from a serious illness, and granted special privileges to the city of Cyrrhus in Syria, where their relics had been brought after their martyrdom. Many churches now claim to have their relics, among them the Jesuit church of St Michael the Archangel in Munich. 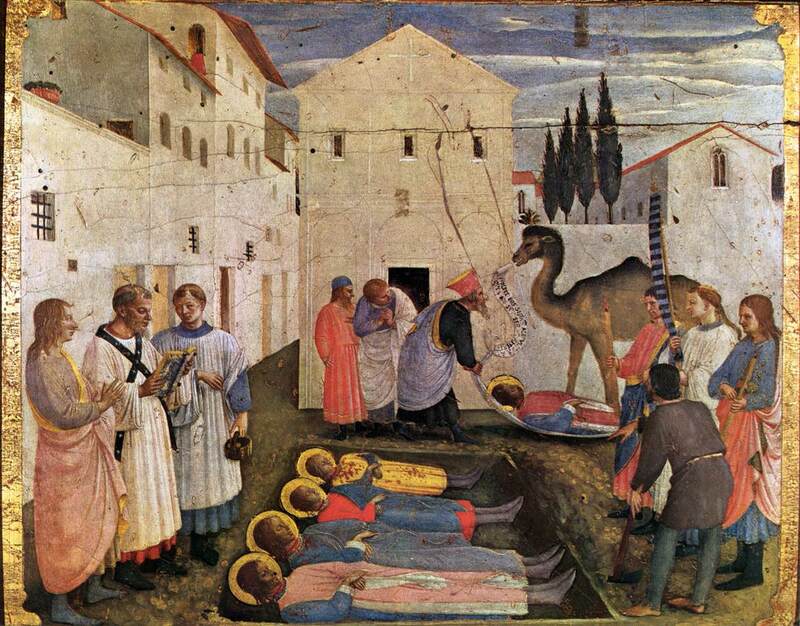 In the fifteenth century, they became particularly prominent in Florence as patron Saints of the de facto (and later de jure) ruling family, the Medici, whose name means “doctors.” In 1437, the Dominican convent of San Marco, newly established in an old Benedictine foundation, was completely renovated at the family’s expense. 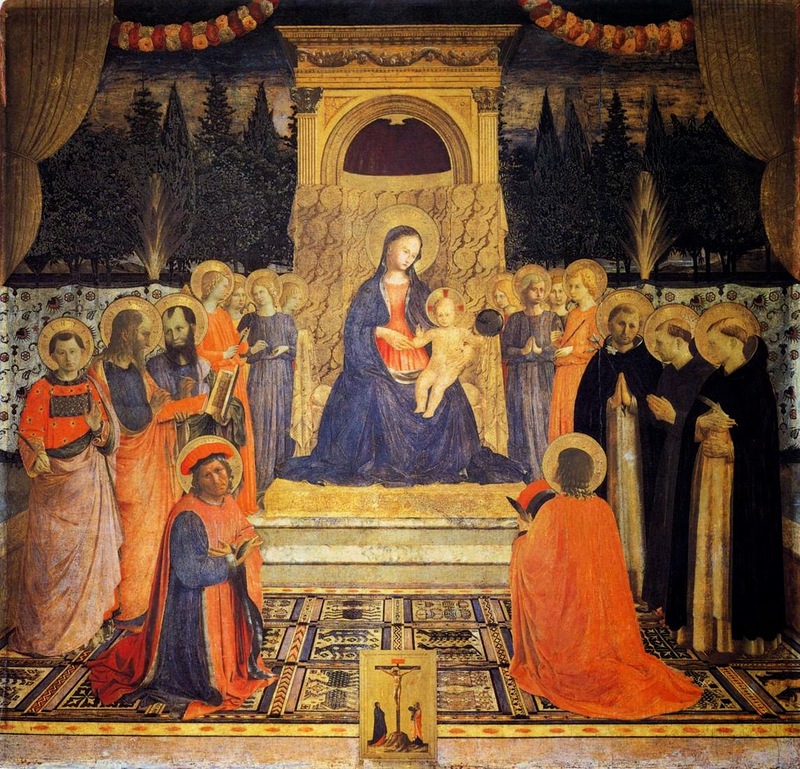 The painter Fra Angelico, one of the founders of the community, was commissioned to do a large altarpiece depicting the Madonna and Child surrounded by various Saints, with Cosmas and Damian kneeling before them in front of the group. 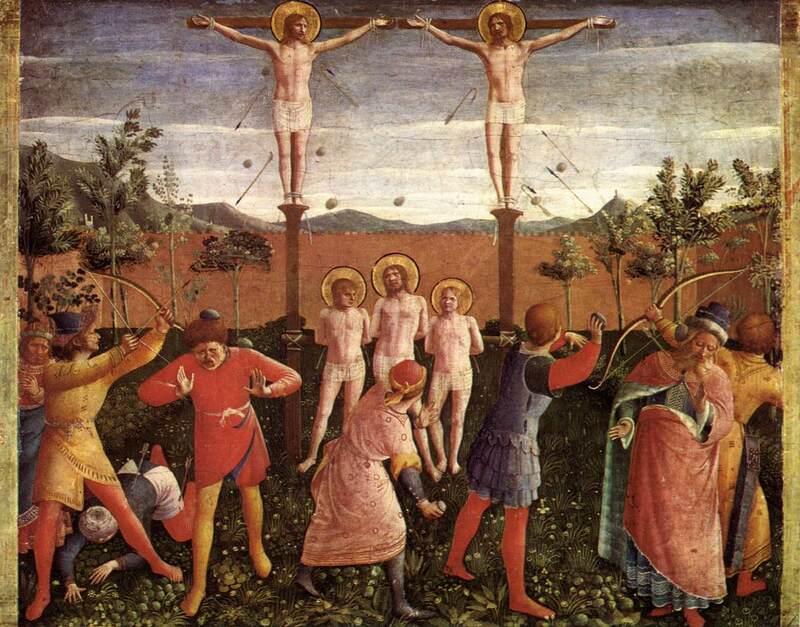 The predella panels depict events from their story as given in the Golden Legend of Bl. Jacopo da Voragine. 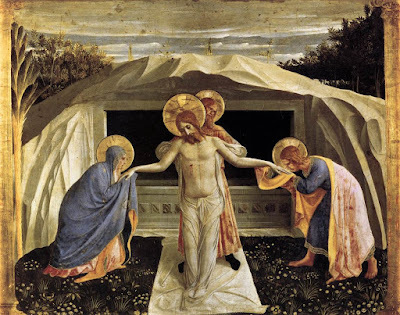 In the first, a woman named Palladia, who had spent all her money on doctors without being cured (like the woman with the issue of blood in the Gospels), is healed of an unspecified ailment by the brothers. 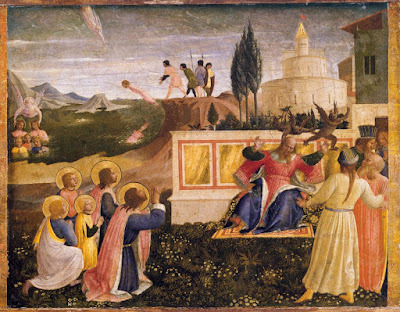 She then compels Damian to accept a reward, at which Cosmas is so indignant that he states that he wishes to be buried apart from his brother, but the Lord Himself appears to Cosmas in a dream and excuses Damian. Since they refuse to worship the idol, the brothers are chained up and thrown into the sea, but are rescued from drowning by an angel. Lysias attributes their deliverance to sorcery, and asks them to teach him their magic, promising to become one of their followers. 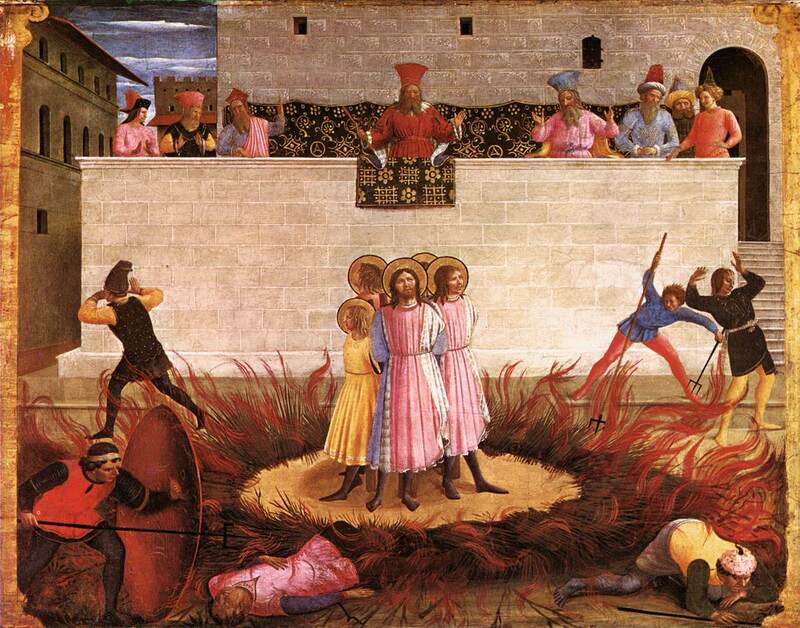 At this, he is immediately attacked by two demons, which depart at the brothers’ prayer. The series is interrupted by this classic Fra Angelico image of the deposition of Christ in the tomb. Cosmas and Damian are crucified, and arrows are shot and stones thrown at them and their younger brothers, to no effect; they are therefore all beheaded. 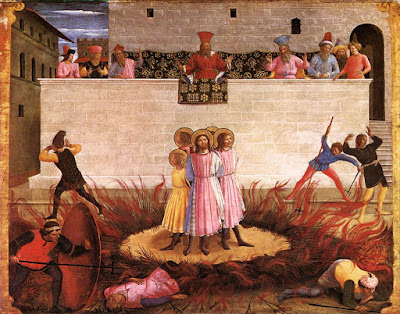 A particularly bizarre miracle is reported of them in the Golden Legend, that shortly after Pope Felix built their church in Rome, the guardian was taken ill with a cancer that destroyed one of his legs. 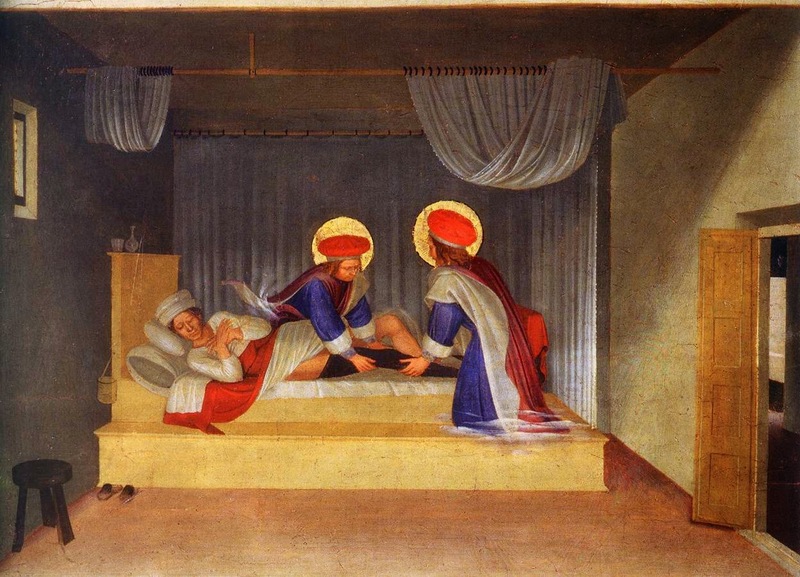 As he was sleeping one night, Cosmas and Damian came to him, and not only removed the diseased leg, but substituted it with a new leg taken from the body of an Ethiopian, who had died that very day and been buried in the cemetery of the nearby church of St Peter-in-Chains.